USA wins the psychological battle again, but now what? The USA's 1-0 victory over Mexico on Tuesday night in Nashville followed in a long line of successes against El Tri in friendly games. Since 1999, the USA is unbeaten against Mexico in 12 friendly games -- eight wins and four ties. Over the same period, El Tri leads the series in competitive games, with an 8-6 edge in victories and one tie, winning key games in recent years: 2-1 in the 2016 Hexagonal opener in Columbus, 3-2 in the 2015 Concacaf Cup and 4-2 in the 2011 Gold Cup final. Those games are all in the past, though. In a battle of rebuilding teams -- only five of the 22 starters had ever previously played in the USA-Mexico series -- the 68th meeting between the USA and Mexico was effectively decided when 24-year-old forward Angel Zaldivar, playing his third game for Mexico, was sent off for a crunching tackle on U.S. captain Wil Trapp in the 67th minute. The red card followed a verbal exchange minutes earlier between U.S. defender Matt Miazga (6-foot-4) and Mexican playmaker Diego Lainez (5-foot-6). With an extra player, the USA quickly took advantage, scoring the game's lone goal four minutes later when Kellyn Acosta found Antonee Robinson down the left wing, and Robinson played the ball back to the trailing Tyler Adams, free to slot home the ball past Mexican keeper Hugo Gonzalez, one of four El Tri starters making their international debuts. The USA won the psychological battle but what else? Almost 11 months after Couva and the 2-1 loss to Trinidad & Tobago that knocked the USA out of the 2018 World Cup, the national team remains a work in progress in so many ways. U.S. Soccer only recently hired Earnie Stewart as general manager, no decision on a permanent replacement appears to be in the offing, and the team continues to muddle through on the field. Is the USA ready for the 2019 Gold Cup or qualifying for the 2022 World Cup? No. With more games will come experience. But there is no evidence yet that the soccer will be good enough. Most of the positives that the players showed are nothing different that those qualities of generations of national team players before them. Burned on Brazil's opening goal, Robinson put a rough outing on Friday night behind him and came off the bench to do what he does best and that's serve a quality cross. And in a game that went from ragged to frantic in the second half, Adams showed composure under pressure, waiting back to find space in the penalty area for an easy goal. As Miazga pointed out afterwards, it's easy to forget that Adams is still only 19 until you look at his baby face. U.S. coach Dave Sarachan said he was pleased with Adams' growth with the ball. "We know he can run and cover ground and win tackles and compete," he said. "But at the next level, can you have a presence with the ball in picking your spots? It just keeps getting better. It's not perfect, but I think he's shown that he's emerging. Everyone's starting to look up to him a little bit. When the game was getting crazy, Tyler was trying to calm it down." 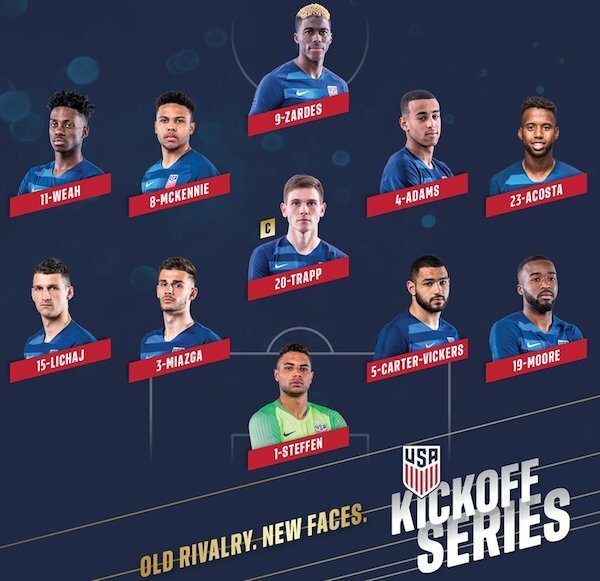 With Zack Steffen in goal, Miazga at center back, Robinson at left back, Adams in midfield and Tim Weahrunning around somewhere up front, some promising new faces -- none older than 23 -- have emerged in the last 11 months. Afterwards, Sarachan said he was proud of "a real collective effort from the first guy to the 22nd. As a staff, what else can you ask for?" He said he's preached to his players about building a team identity, a not insignificant goal considering the team's youth. "We nitpick on the technical side," he added, "but you saw a team tonight that played aggressively, competed hard and won most of their duels. I think that's been a constant over the time I've had the group and over the past two games against Brazil and Mexico." The problem, of course, is that it's not "nitpicking" to address the technical side. When Sarachan says as he did after the game that the play on the ball was "a little better" but "still an area to improve," he was dancing around the issue. Time and again in the first half, in particular, U.S. players failed to complete passes or hold the ball. It was only when the game fell apart and Mexico went a man down did the game open up for the USA to take charge. For all the promise of central midfielders Weston McKennie and Adams -- one a Bundesliga starter at the age of 19, the other likely headed to Germany at the same age in January -- they struggle mightily to take control of the game when playing together. Things will improve -- they have to. Sarachan started two European-based players -- Cameron Carter-Vickers and Shaq Moore -- who changed clubs on loan but have yet to play a game this season for their new second division clubs, and a third player -- Weah -- who hasn't dressed for his team, French champion Paris St. Germain, for the last two games. That can't continue. Yes, the soccer should improve when Christian Pulisic and perhaps Darlington Nagbe return to the lineup. A player like Jozy Altidore can add a presence lacking at center forward. But the USA can't rely on winning the psychological battles if it's to succeed. 16 comments about "USA wins the psychological battle again, but now what?". s fatschel, September 12, 2018 at 9:48 a.m.
PK: Always nice to wake up to your negative view of these kids. Even when they win they don't according to SA. Frans Vischer, September 12, 2018 at 11:52 a.m.
Gotta disagree with you, s fatschel, and agree with PK. I'm glad we won, but I expected lots more from our youngsters. Mexico was clearly the better team. There's plenty of hope for improvement, but this should have been a better display. And I'm disappointed in Sarachan's praise- lots of basics missing- completed passing, intelligent passing and movement off the ball. The US was static for long parts of the game. We gotta get better! s fatschel replied, September 12, 2018 at 1:18 p.m.
FV: it's all relative, why would you expect a better performance against superior competition from a better system? Our youth system is severely flawed and on the decline. Lack of best athletes due to other sports, pay to play, lack of D3/4 pro leagues, etc, etc. Lets give more credit to these kids for the win, which is not so easy. Bob Ashpole replied, September 12, 2018 at 2:31 p.m.
s fatschel, I am a little confused. You just criticized PK for a "negative view" of the US MNT team fielded last night, but then you defended your criticism with a negative view of the US youth development system. Are you saying any result should be praised because the players come from a substandard system? You also described Mexico as "superior." I think this is the problem that a lot of us have--Mexico should not be superior to the USA. We have, however, fallen from our dos-a-cero superiority under JK. That is the problem. We declined instead of moved forward, and I am not talking about failure to qualify for the 2018 finals. The decline exists whether we qualified or not. s fatschel, September 12, 2018 at 3 p.m.
BA, correct. Again it's all relative and IMHO the result was good considering. If we had played a weak opponent of course passing would have been much better. But for Spain like result youth system leaders need to look in the mirror and make changes. Isn't insanity doing things the same way and expecting different results? Bob Ashpole, September 12, 2018 at 3:58 p.m.
Why is no one talking about the hunt for a MNT coach? Twellman said it best: the projected schedule is timed for the end of the MLS season. If USSF is looking to hire an MLS coach, why did it waste a year? They could have hired an MLS coach last January. This big search is just for show. s fatschel, September 12, 2018 at 4:31 p.m.
BA Perhaps 6 weeks is not long enough (wouldn't be in any other industry) or maybe they have someone but can't say. I don't think it matters as current coach has been excellent. The negativity from SA I think is to stir the pot to compensate for lack of investigative reporting or just to say nothing meets our expectations because we are the authority. beautiful game replied, September 12, 2018 at 5:18 p.m.
s fatschel, "reality TV" must be your liesure time. I watched 2/3 of the game and both teams showed little if anyting. The USMNT goal was the only highlight for me, well executed with efficacy; the rest was exercise in futility...not worth the price of admission. s fatschel replied, September 12, 2018 at 5:31 p.m.
Beautiful Game...will respond but can you give the curtosy of your actual name? R2 Dad replied, September 16, 2018 at 5:28 a.m.
sf, you're never going to change the nature of the internet. I don't use my real name because I'm a (nobody) referee and the last thing I want is someone claiming I have biases on the pitch. I absolutely DO have biases, but they're mostly due to the earned reputations of idiot parents and coaches who are ruining the game for our kids. humble 1, September 13, 2018 at 9:49 a.m.
classic red herring win. Lots of question unanswered. Two steps backwards one step forward. That said, it's ok as US Soccer is still in its childhood and the sport is rooting. It is a long road and failure is always a stop on the path to big successes. Focus on what you can do to make things better, even if it is to point out what is wrong. It's all good. Philip Carragher, September 13, 2018 at 11:03 a.m.
Was anyone else bothered by the assumption in Twellman's comment about where to position a player based on which foot he can cross the ball well with? The assumption Twellman communicates is that it's acceptable for high caliber players to only be able to use their right or their left foot to send in dangerous crosses. Why not both feet? What happened to that? Both feet, two feet, both highly dangerous weapons, (at least at this level). It isn't that difficult for a great athlete to perfect crosses with both feet, yet, who can do that? Bob Ashpole replied, September 13, 2018 at 12:47 p.m. When a winger cuts inside to pass, he isn't crossing because he is passing in the direction he is moving. Twellman (and I) think of crossing as a striking technique rather than a direction that the ball travels. I think this is like saying that its acceptable for a dead ball specialist to perfect strikes with just one foot. Being 2 footed is ideal such a player is much harder to defend against. frank schoon replied, September 13, 2018 at 1:19 p.m.
Philip Carragher replied, September 13, 2018 at 2:37 p.m.
Bob and Frank, shouldn't we expect that players at the international level be able to strike the ball with near equal expertise with both feet? Although expecting that the right foot of players with magic left feet like Messi or Hagi or Shaqiri is probably too much, shouldn't the journeymen of soccer possess two good striking feet? It's not that difficult for a great athlete to learn to kick well almost equally with both feet, especially when all they're asked to do is send accurately directed and weighted balls from a sideline into the box. frank schoon replied, September 13, 2018 at 4:01 p.m.
Philip, you're exactly right....you should be able to use both feet, but they don't, only a few can. Maradona, 2meters from the goal couldn't hit it with his right but had to place it back on his left to shoot. You have to ask yourself after your kid has been with Developmental Academy for the past 8-10 years and paid over 10k dollars, why he isn't able to cross the ball, shoot , dribble , trap the ball with either foot or pass the ball with the outside of either foot.Players can't even make a decent cross with their best leg. Realize kids have also got to work on their own but the DAs are no help. licensed coaches, laptop coaches, coaching seminars, all the latest poop on soccer you can get,training academies, but the bottom line is where are the players that can play with either foot and worse these can't even make decent crosses with their strong leg. The players you mentioned like Maradona, Hagi, van Hanegem, are so extremely leftfooted and gifted that they can survive. Also leftfooted players tend to be more leftfooted than rightfooted players are rightfooted.